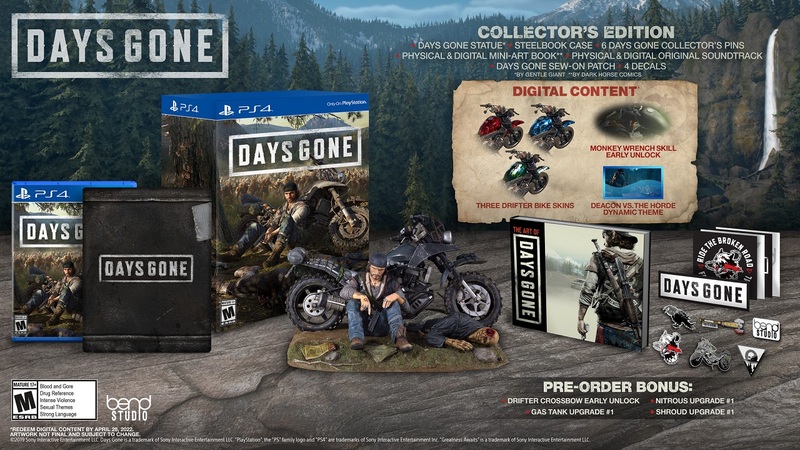 Game publisher Sony Interactive Entertainment and developer Bend Studio recently revealed the official details of the upcoming release of Days Gone and it special edition and bonuses. The collector’s edition of the video game will include the Digital Deluxe version, which will be detailed below. It will include an awesome statue that features its protagonist Deacon St. John and his bike. It will also come with patches, six pins, four decals, a steel book case, a physical version of the soundtrack, and a mini artbook from Dark Horse Comics. It will have a retail price of $139.99. A Digital Deluxe Edition is also available. It will include a digital artbook, digital soundtrack, three bike skins, and an extra skill unlock and theme. The pre-order bonuses of the game will allow players to unlock the Drifter Crossbow. It will also unlock other additional upgrades for the bike’s gas tank, nitrous, and shroud. These are actually good materials that can really help early in the game. Those who will pre-order the game digitally via the PlayStation Store will also score a new dynamic theme that will feature a sawmill from the original gameplay reveal. The game will launch this coming April 26. It will be exclusively available on PlayStation 4.